Fixed, where a sample can be measured at up to ten individual wavelengths per run Scan, where a sample can be measured between two wavelengths at a maximum resolution of 1nm. This is displayed as a plot of absorbance against time. Quant, where a calibration plot is constructed from a range of standard solutions and the unknown samples are measured and their concentrations computed by the software. 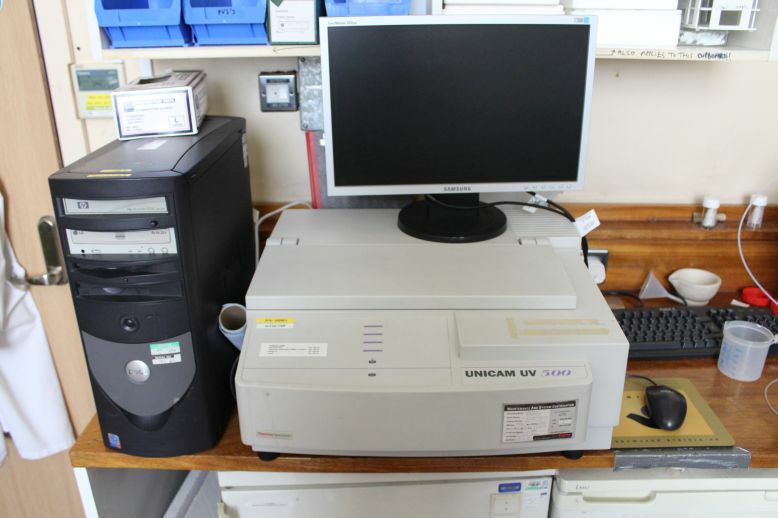 The Unicam UV spectrometer is a dual beam instrument with an eight position vial holder allowing seven samples and a reference to be measured in one run. It has a tungsten lamp for the visible range and deuterium lamp for the UV range. This allows it to measure from 190 nm in the UV range to 900 nm in the visible range. During a scan that traverses both the visible and UV ranges the point at which the lamps switch over can be set to between 315 nm and 340 nm to avoid interference with important peaks.